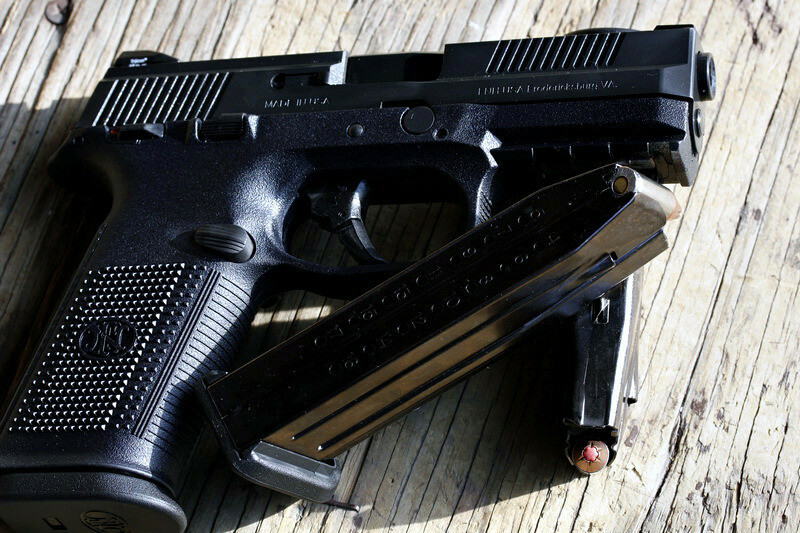 I wrote this review a while back, when I purchased the FNS-9 pistol when it first became available. I had it on order before it was available, because I really wanted to try it. This review has a different template, I posted this on m4carbine.net and figured I would repost it here. 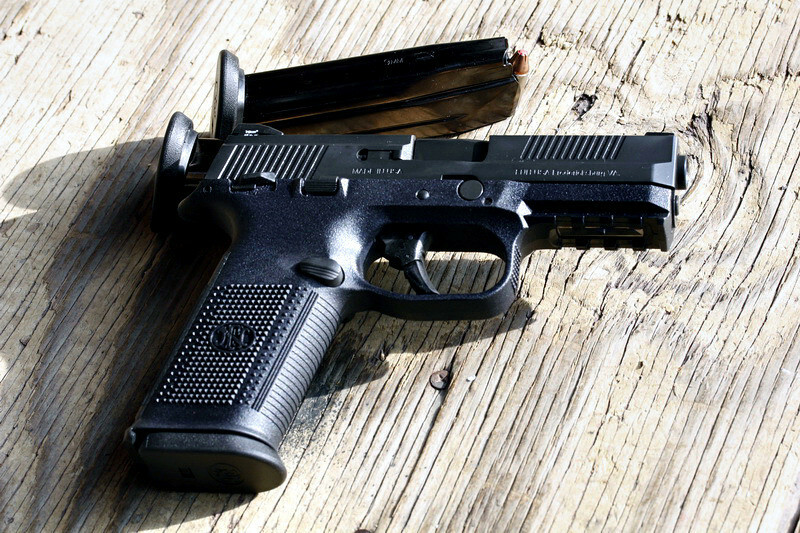 I bought the FNS-9 specifically because I had an FNP-45 Tactical and it is a great gun, the only complaint was the external hammer (my opinion). 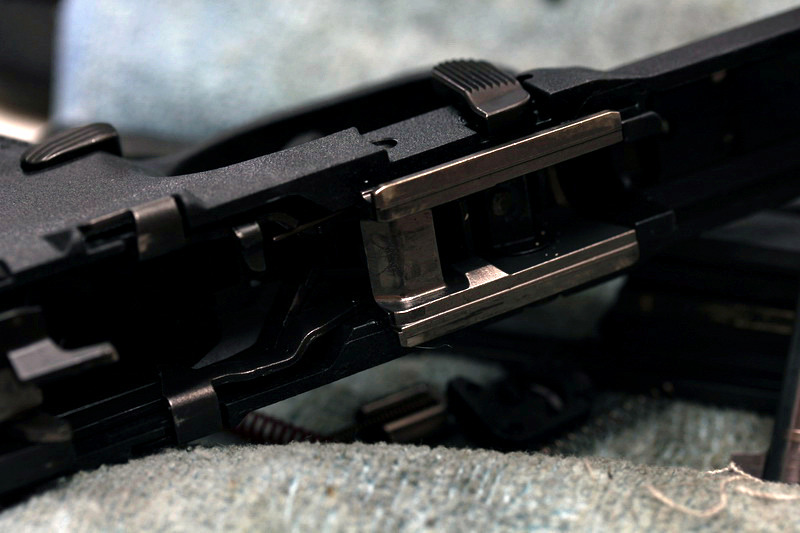 This gun "bridges" the gap between the external hammer FN pistols and what I carry off duty currently, G4 G19. When I first took it out of the box and did some dry fire I could quickly see why the gun is going to be very popular. Very comfortable grip, follows my natural line of sight to the target. The trigger was crisp, but the reset length (compared to my G19) was instantly noticeable. I wanted to figure out how this gun shoots before I started with any type of serious drills with it, I shot my G19 right next to it to be able to see the difference between the two. My instant observation was that you needed to be on the bottom half of the trigger. 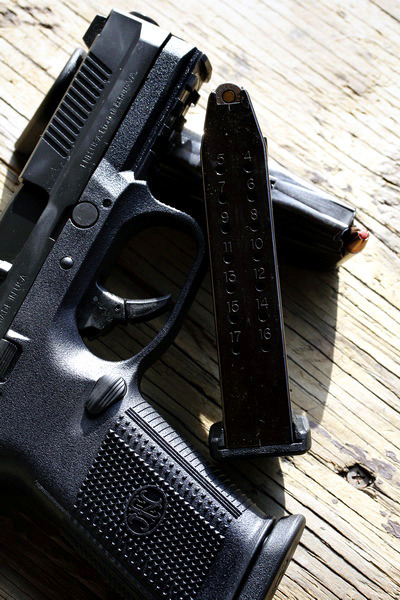 The gun has a trigger "safety" like the Glock does, but it cannot be defeated by only pulling the top of the trigger (like I do with my G19 - finger is usually at the top of the trigger, makes for a cleaner pull). You can see by these pictures what I am talking about. 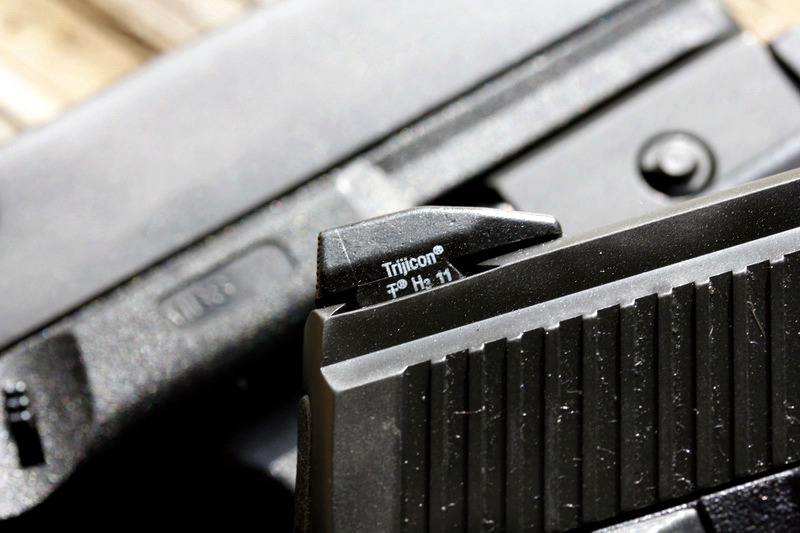 The top of the trigger will not move until the bottom is engaged. Once I got to shooting a few rounds I quickly understood the trigger reset was going to be annoying. (Since my G19 has a much shorter reset) Once you fire off the round you almost have to let the trigger go 3/4 of the way back for it to re-engage. Unlike on the Glock where the distance is probably half that, if not more. 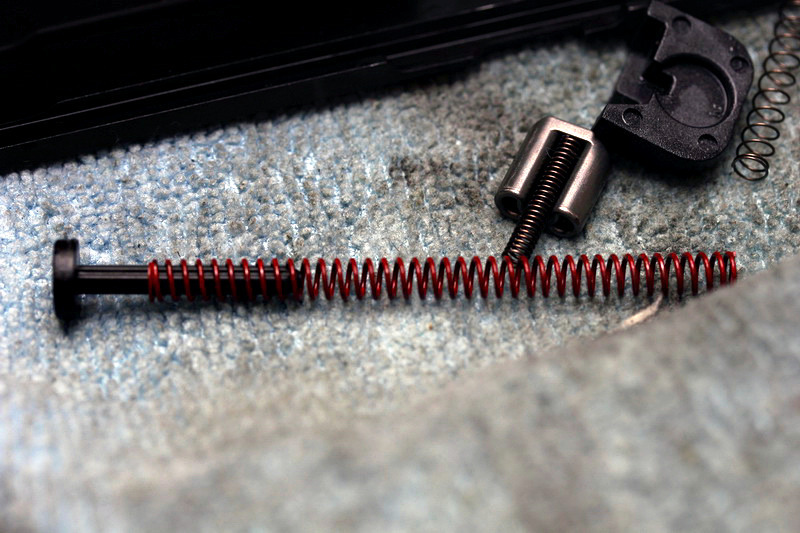 The trigger itself is nice, but getting to know the "sweet spot" will take a lot more shooting. 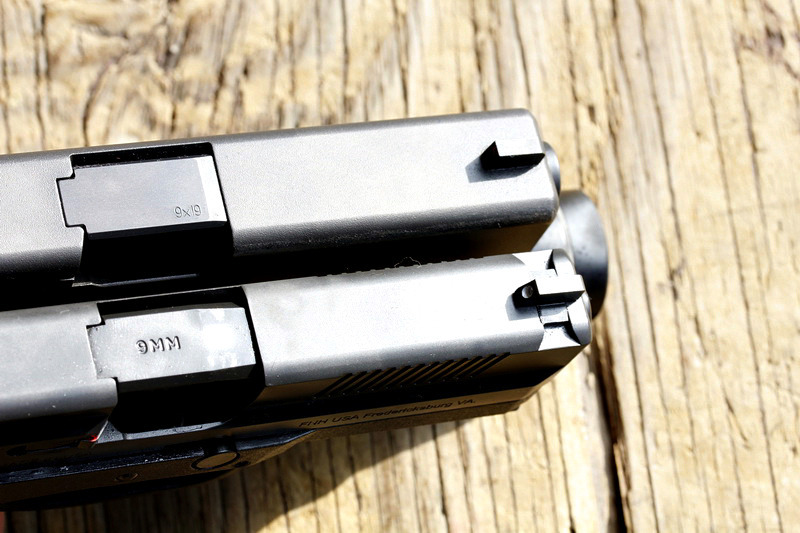 As you can see this FNS-9 came with Trijicon night sights. Pretty much same sights I have on my duty gun (G21) so it was easy to use. 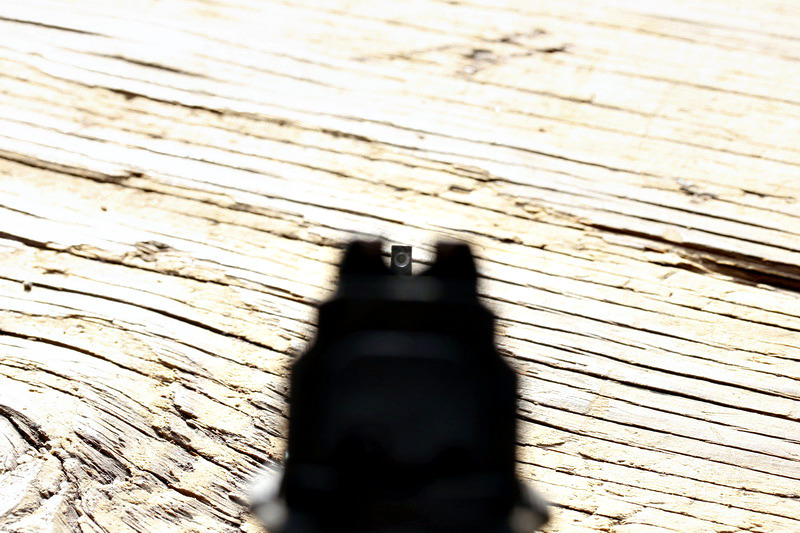 The biggest and most obvious difference between the G19 is the way you use the sights. 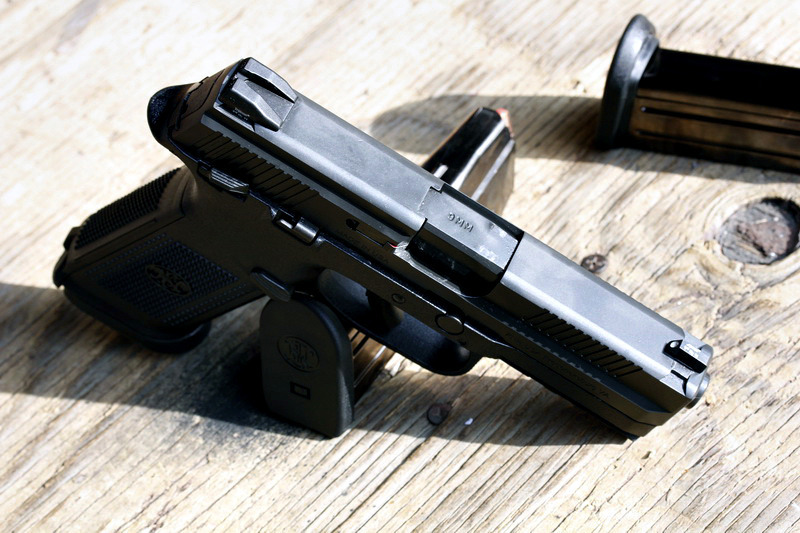 With the G19 the sights align, equal height, equal light and you hit right on the top of the sight (like slicing a target in half). With the FNS-9 you have to aim dead center of the circle. I was hitting all low at first, and I wondered why, because I was aiming it like a Glock. I raised my sights and magic! Tight groups all the way out to 25y (once I got the trigger pull down). I put the thinner back-plate on the FNS-9 and it was still slightly less comfortable than the G19. (Maybe I am just too used to shooting the Glocks?) 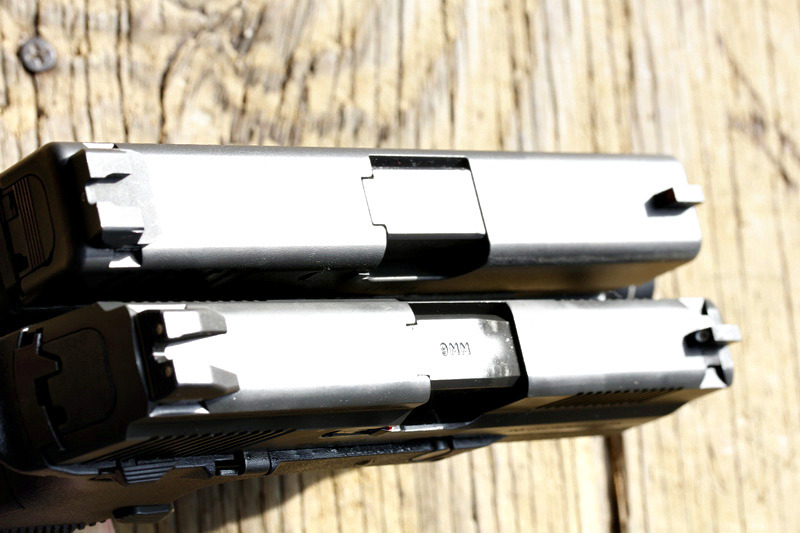 They are about the same size with the FNS9 being slightly thinner profile and more capacity (17+1). 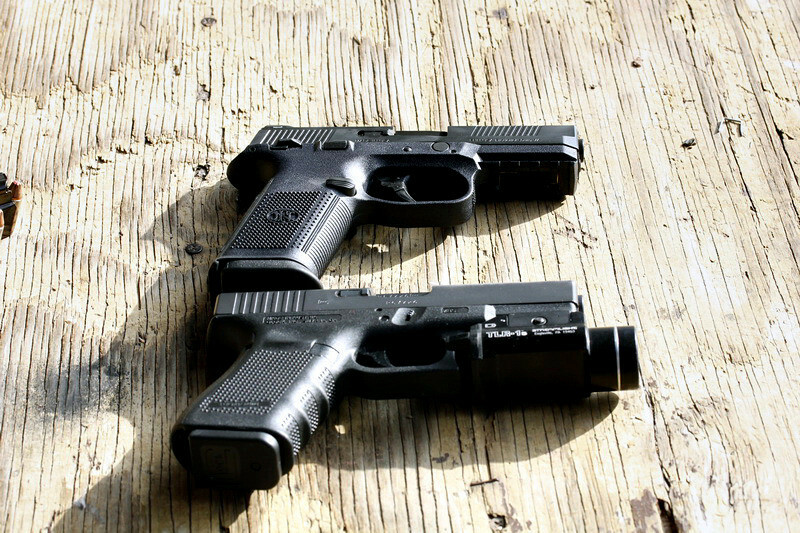 Obvious differences include the ambidextrous controls on the FNS-9 and "ease of use" of those controls. 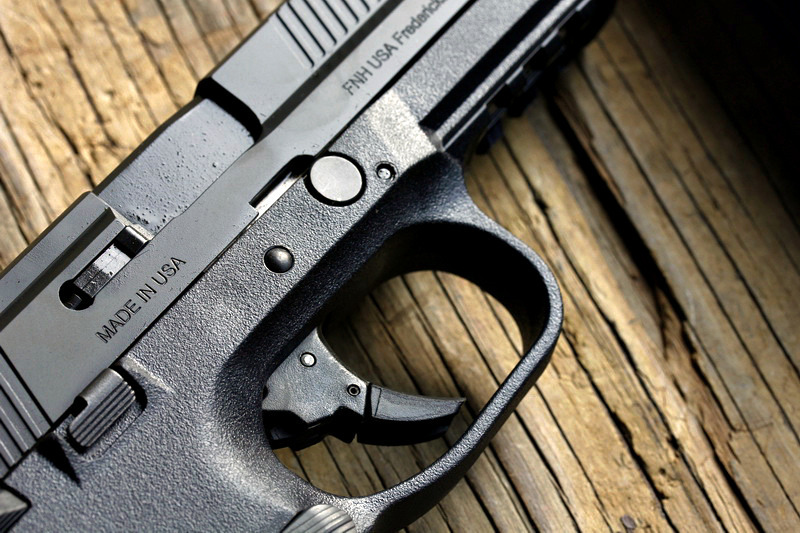 The FNS-9 has big robust controls and it can be manipulated one handed, either hand without issue. I did a string of fire, loading and reloading, other strong hand and it was very easy - even engaging the safety. 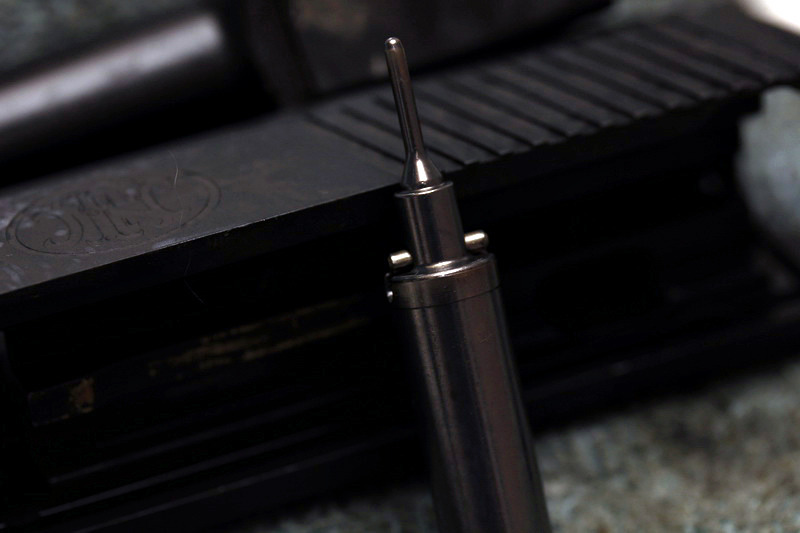 Look at the extractor, you will see a hint of "red" which means the gun is loaded. 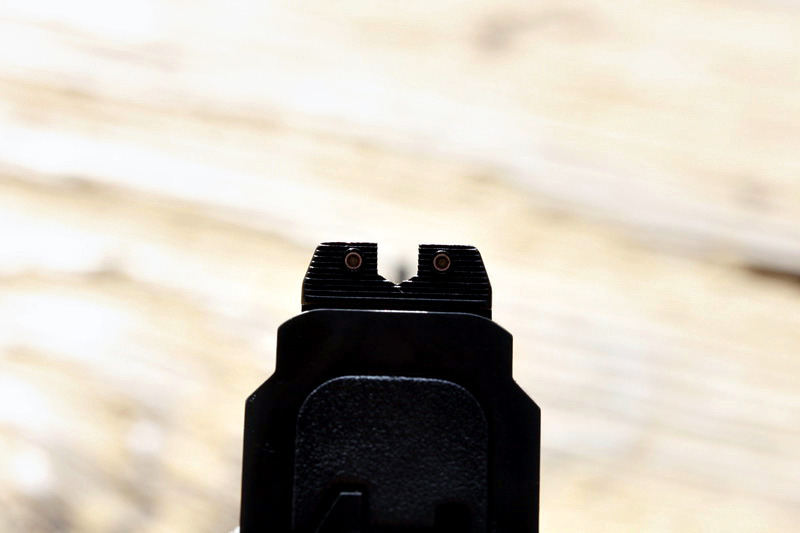 (With a snap cap for picture purposes) A little added feature you do not normally see (on Glocks anyway). 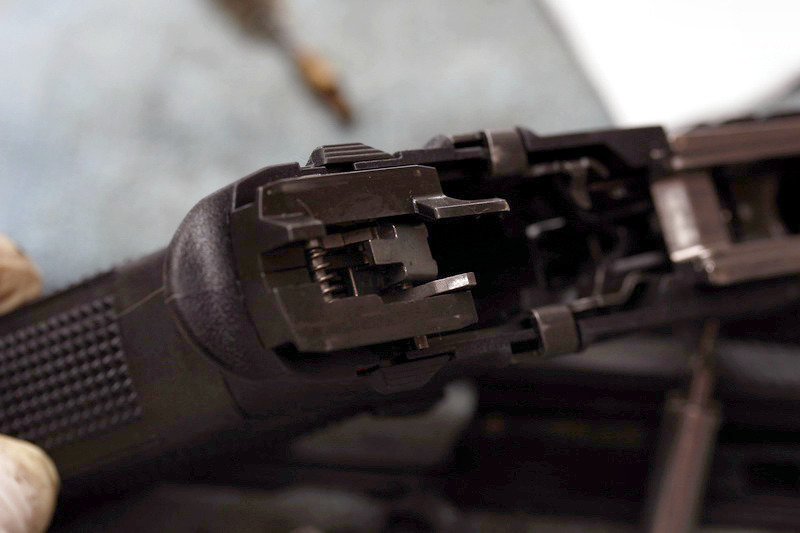 The FNS-9 came with 3 17rnd metallic magazines with a flat end plate. They load easy, drop free without issue and clean easy. The gun felt about the same as my G19 (with trl1-s + 15+1rnds). I do not know if I was just unaccustomed to it or what, I did not have a digital scale to actually see the difference (maybe a different day). 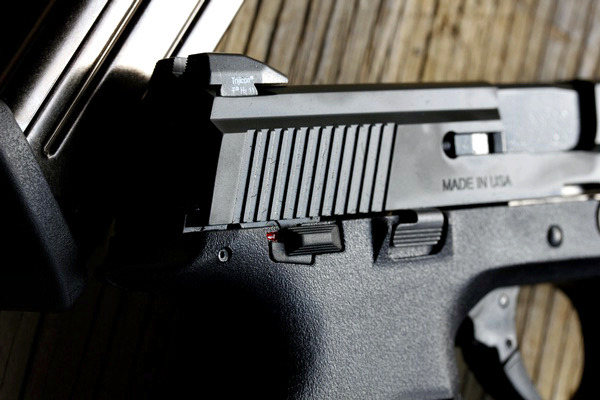 As you can see by the pictures the internals greatly mimic the Glock and M&P pistols. 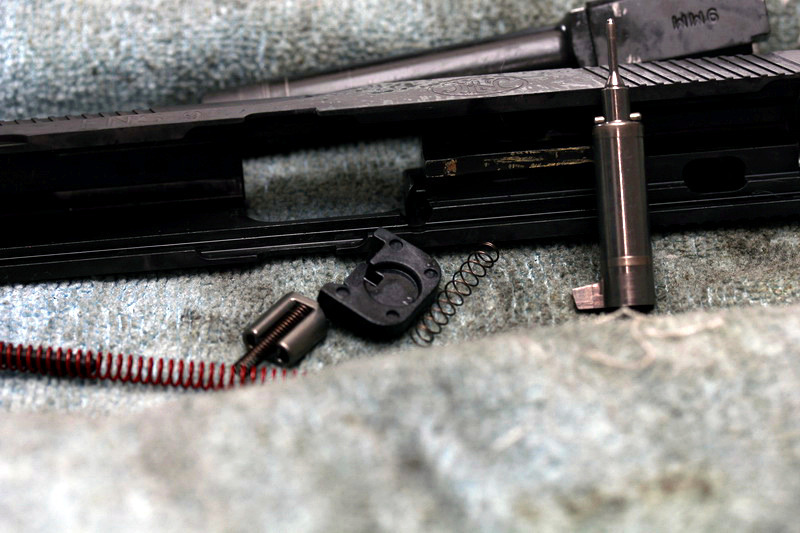 The gun comes apart the same as a Glock for the most part (I am a Glock armorer, so I did not just butcher the gun trying to take it apart). Easy to clean on the inside, one part that stood out to me right away was the rear slide attachment points on the lower half. 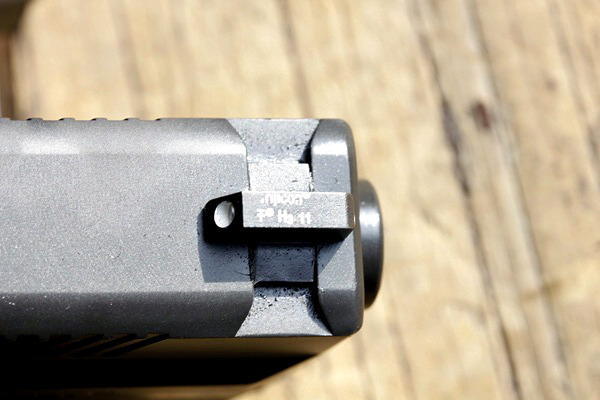 In the first picture you can see the ejector pin and it looks like it is connected to the entire rear slide attachment point. Absolutely ZERO issues, malfunctions or otherwise. I fired 147gr federal's, WPA/Wolf 9mm, even shot some RUAG Ammotec zinc 9mm's through it. No issues. The 147gr federal's performed the best out of the group (better than the critical defense) since I had the tightest groups at 15y, the RUAG junk was all over the place, especially at 25y. At the end of my quick trip to the range I decided to do some double/triple taps with it, since my G19 is fairly easy to use in this regard. This FNS-9 needs getting used to. The trigger is just so damn long on the reset I found myself engaging the trigger before it fully reset. While this is not a "bad" thing per say, it is definitely a training issue which will correct itself through more shooting. I will not modify the gun as of yet, unless someone releases some sort of "shorter trigger pull/reset" for it (which is doubtful). My recommendation is if you want a very nice range gun this should be high on your list. Very fun to shoot and something that offers a different type of shooting than your standard Glock or 1911. I will probably take this gun to a training class or two for pistol work and see how it holds up (later in the summer). I will however not be carrying this gun off-duty, the trigger does not give me the confidence I have in my G19 and the sights need to be changed or I need to train myself to get used to them.